VietNamNet Bridge – The Yok Don National Park is being opened up to visitors as a way to increase public awareness of the need to protect biodiversity. 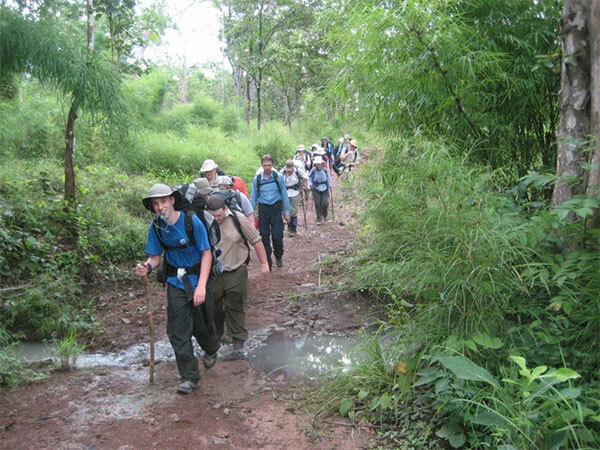 Long walk: A group of tourists begin a trekking tour through the Yok Don National Park. It was a chilly afternoon and there was a sense of quiet excitement and anticipation as we set out on our first foray into Yok Don National Park in the Central Highlands province of Dak Lak. Crossing a bridge over the Serepok River, we arrived at the edge of the forest as the sun was going down behind the mountains and the trees were gradually cloaking themselves in the mysterious darkness of the night. Tran Duc Phuong, vice director of the Centre of Environmental Education and Services in Yok Don National Park, said it was a perfect moment of the year for us to contemplate the flowers blooming in the forest before every tree shed its leaves in the struggle against harsh conditions of the dry season. After months battling thirst, as soon as the first rains of a new season arrived, the forest revives, putting on a new green coat on the Dipterocarp trees. Yok Don National Park is the only place in Viet Nam that possesses such a unique forest, he said. 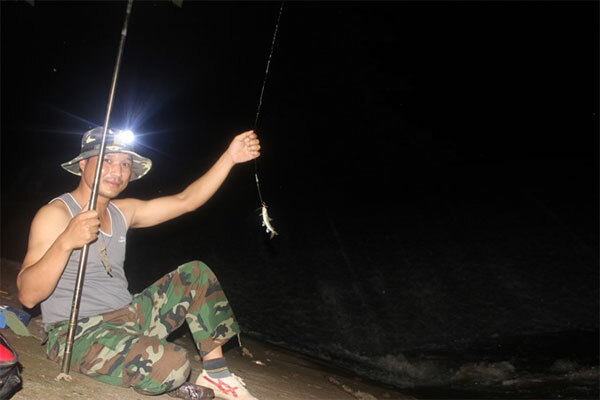 Catch of the night: A visitor goes fishing to prepare for dinner in the Yok Don National Park. After trekking through the forest for nearly 10 kilometres, we were all exhausted and hungry. We stopped by Dak Lau Stream to prepare dinner. Each of us took over a task: some went fishing while others collected the wood to grill com lam (bamboo-cooked rice). Nguyen Van Long, director of the Centre of Environmental Education and Services, said opening eco-tours in Yok Don National Park aimed to spread the message of forest protection. They can also learn about the traditions and customs of ethnic minority communities in the area, like the E De. There are other tours where one can join gong dances and drink wine through long bamboo stems, but doing this in the midst of a thick forest is something else. 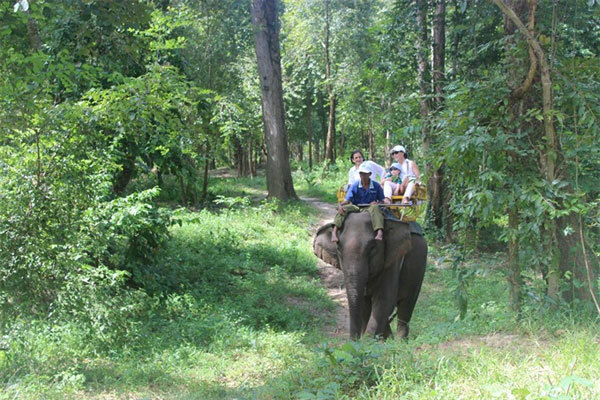 Broad back: Riding on an elephant is a unique experience that visitors to Yok Don National Park can enjoy. At the crack of dawn, with the raindrops still on the leaves, we went elephant "hunting". 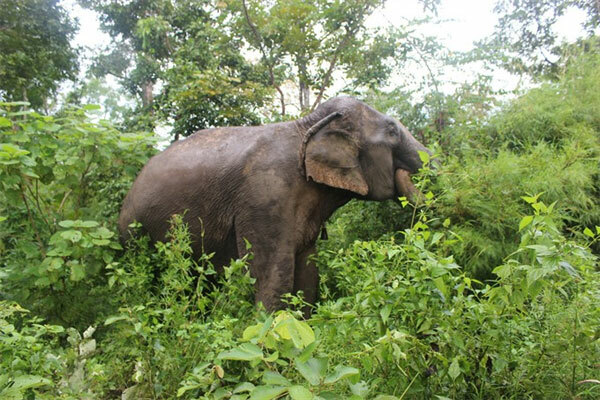 This meant following a 50-year-old mahout called Y Muc Bya, who has dedicated half his life to the profession, into the forest for about five kilometres, searching for an elderly female elephant called Y Tul. After patiently walking for an hour through the forest, Y Muc discovered some footprints, which became clearer as we followed them. She was eating, but on seeing strangers, Y Tul stood still to assess the situation. As soon as she recognised the familiar voice of Y Muc, she waved her big ears and tail in response. Y Muc signalled Y Tul to come back home. Understanding her keeper, Y Tul obediently followed him, grabbing some leaves as she walked back. “Y Tul is sometimes naughty, and does not listen to me. I get annoyed but have never hit her,” said Y Muc. “I have known her since 1990, when she was small so, I have have always loved and treated her like my family member. Y Muc also revealed that there is a kind of tree in the forest that looks similar to tamarind trees but has a white bark. Elephants are very afraid of these trees, and can go crazy if they are tied to them. Therefore, the mahout has to lead the pachyderms away from these trees. As soon as we arrived at the Serepok River, Y Tul hastily rushed into the cool transparent water to take a bath. That was the end of our lesson in becoming a mahout. Everyone was happy with the encounter with the gentle giant. Gentle giant: A female elephant, named Y Tul, leisurely munches on leaves at the Yok Don National Park. Yok Don National Park has a total area of 115,545sq.m spanning Dak Lak and Dak Nong provinces. It is managed by the Vietnam Forestry Administration. It is home to 858 species of flora, 120 of which are precious trees and 64 are herbal plants. The fauna is diverse, too, with 89 mammal species, 305 bird species, 48 reptile species, 16 amphibian species, 50 kinds of fish and over 437 kinds of insects, many of which are on the national and international lists of endangered species.